The leadership of Green Ronin will be meeting off site over the next few days to discuss these matters. If you have any relevant information you think we should know, please send it to custserv@greenronin.com. Thank you. 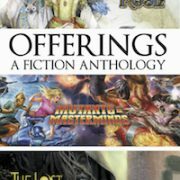 We are pleased to present, for free download, “Offerings, a Fiction Anthology,” a sampler of fiction from three of our upcoming fiction releases. In case you missed it, we recently announced Nisaba Press, Green Ronin Publishing’s new fiction imprint, helmed by Managing Editor Jaym Gates. The Prologue from Shadowtide, our first romantic fantasy Blue Rose novel by Joseph Carriker. “New Girls,” by Crystal Frasier, set in the super-heroic world of Earth-Prime from Mutants & Masterminds. 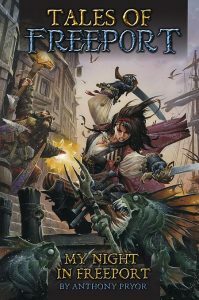 “Requiem, In Bells,” by Ari Marmell, set in the fantasy horror-survival world of The Lost Citadel. 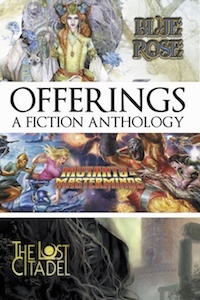 We hope you enjoy this offering from our first few fiction titles. We can’t wait to share our worlds with you! Today’s RRT is by guest artist Andrew Law, who decided to share some insight into the process of creating his incredible map artwork for The Lost Citadel! 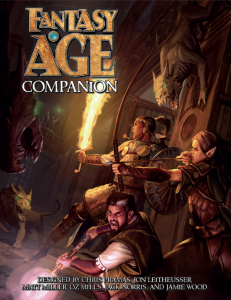 Our Kickstarter has just one week left, if you’re a fan of 5th edition, you should really do yourself a favor and check it out now! I’ve created hundreds of images during my professional career as a cartographer, but none excite and terrify more than the opening act: drafting the first map for a new setting. Y’see, the first map is special. It sets the tone and mood for everything that comes after. It will be referenced, and re-referenced many times over by both the creators of the setting and the consumers, so it stands as an oft-trod gateway into the new world that many will come to know and love. In short, I’m not just creating a map, I’m also introducing an entire setting with a single image. Fortunately for me, The Lost Citadel has a wonderfully detailed writers’ bible that brings the setting, for all the Dead haunt its every corner, alive. So, there was already a wealth of detail to inspire me. All I had to do was draw it. With all that in mind, I prepared to draft the first map. To begin, I referred to the design brief and did my best to conceive of something that would fully represent as much of The Lost Citadel as possible. So, what did I have to create? 1) Create a vertical/portrait map with the same dimensions as the Freeport city poster. 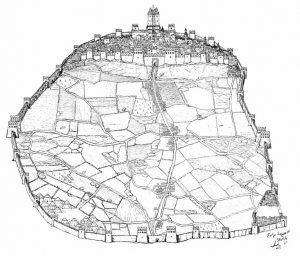 2) Depict the outer city of Redoubt, some buildings of the inner city, and point to other important locations off-map. 3) The style should draw from various Middle Ages to Renaissance sources from East to West, but match none exactly, to best represent the artistic style of the current inhabitants of Redoubt. 4) The map will illustrate some of the setting’s core concepts and historical details, in order support the existing world-building and introduce readers to The Lost Citadel. And, now knowing what was required, I set to work. To begin, I first sketched the area to be mapped. It was immediately obvious the city, plus the volcano behind it, would fill a broadly squarish area. This being the case, I’d need extra material to fill the top and bottom of the final image. The bottom section was easy to resolve — a nice big title plate emblazoned with something like ‘THE CITY OF REDOUBT’ would likely do, perhaps illuminated with some in-game detail — but the top was a little more problematic. What should go there? To answer, I had a good think about the setting, and what would allow me to add some of the details from the writers’ bible directly to the map. Eventually, I went with what I felt was the obvious answer: I decided to continue the map up into the sky, providing an opportunity to draw some of the setting’s celestial details as well as its terrestrial. So, with that decided, I sketched it all out then began work on the detail. After completing the preliminary sketches, I developed the central area of the image: the map of the city, the volcano, and the extras surrounding these. 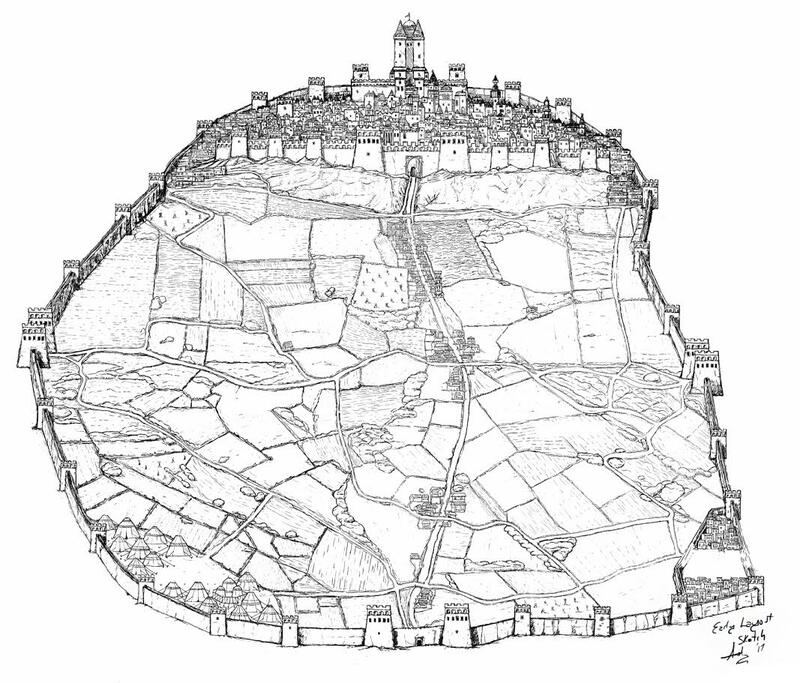 The map itself was created in a simple style reminiscent of many Middle Age maps from the East and West, but without some of the goofier attempts at perspective or scaling often on display in such older cartography. 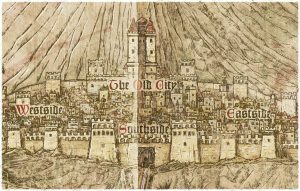 As a nod to these medieval sources, I presented almost all towers and buildings as front elevations, hinting at a simplicity of artistic capability, but drew the surrounding city walls with a little more sophistication to ensure the image didn’t look too abstract. I then set about filling in all the details between, making space for all the outer city’s fields and primary districts. I then drew the inner city, which I presented as a crowded pile, with a small proportion of the many buildings on display. More information concerning the Inner City will come with the next map for The Lost Citadel, one that was unlocked as a poster when the Kickstarter reached its 29K stretch goal, so I wasn’t concerned about the lack of precise detail here. Outside the city walls, it’s all ‘no-man’s land’ and ‘here be dragons’ (well, the Dead). All manner of dead things are drawn beyond the walls, mirroring the sea beasts of ancient ocean maps, and the dragons/monsters from similar land maps. They demonstrate the ignorance of the artist in question as to what actually lies beyond the walls, and the ignorance of people as a whole concerning the Dead and what they are. This ignorance is reinforced by the map depicting nothing beyond the eyesight of those who walk the walls; i.e. : this is a map of all that is left of the known world to the inhabitants of Redoubt, which is pretty bleak given the small area shown. 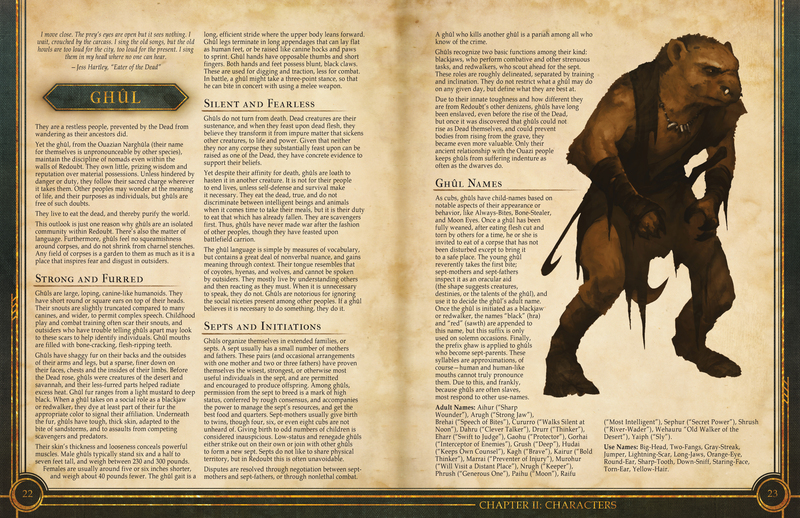 In addition to these semi-mythical undead creatures, some ruins and basic geographical detail was added. Also, five hands were then depicted pointing to distant locations (at the four corners of the central map and another at the bottom of the image below the title plate). That all done, it was time to turn to what lay above the city and the volcano: the heavens. Drawing the heavens provided an opportunity to depict the two moons of the setting — that’s the moons that are used in the ‘O’ of The Lost Citadel’s logo, if you hadn’t noticed, so I felt it was an important addition. Also, to support one of the central conceits of The Lost Citadel, I associated both moons with the Dead and drew them as skulls. This made sense as the moons are most visible at night, a time of danger, when it’s harder to see the Dead creeping around. To frame the sun and moons, I drew the heavens as a great arc filled with stars, implying the in-setting artist who created the map knows the world is a globe — or, at the very least, has copied this detail from an earlier source. I chose to do this to show that for all the old civilization has come to an end with the rising of the Dead, some of the high knowledge it gathered still, in some form or another, endures – after all, the time before the Dead rose is still within living memory of some of the city’s eldest inhabitants. So, for all the truth of the world as a sphere surrounded by celestial objects is undoubtedly unimportant to the shoulder-to-shoulder common folk scraping out the barest of survivals within Redoubt’s high walls, older truths are still present in the city’s few examples of art, and such lore is possibly not lost to all scholars. That done, I added some clouds to the top corners and was ready to move on. Next up, the bottom of the image, and the titles. The title plate was both the easiest and hardest section to create. First, it’s just a few words bunched together, so what could be simpler? But I wanted it to be more than that – to recall the illuminated letters of many Middle Age documents – so I decided to go a little farther. After some thought, I figured depicting one of the key events in the his tory of Redoubt – when the Dwarfs who built the city were enslaved – was essential, and I also thought it important to weave the Dead directly into the lettering in some fashion. So, I set to work drawing the capital ‘R’ of Redoubt with a whole bunch of extra details. 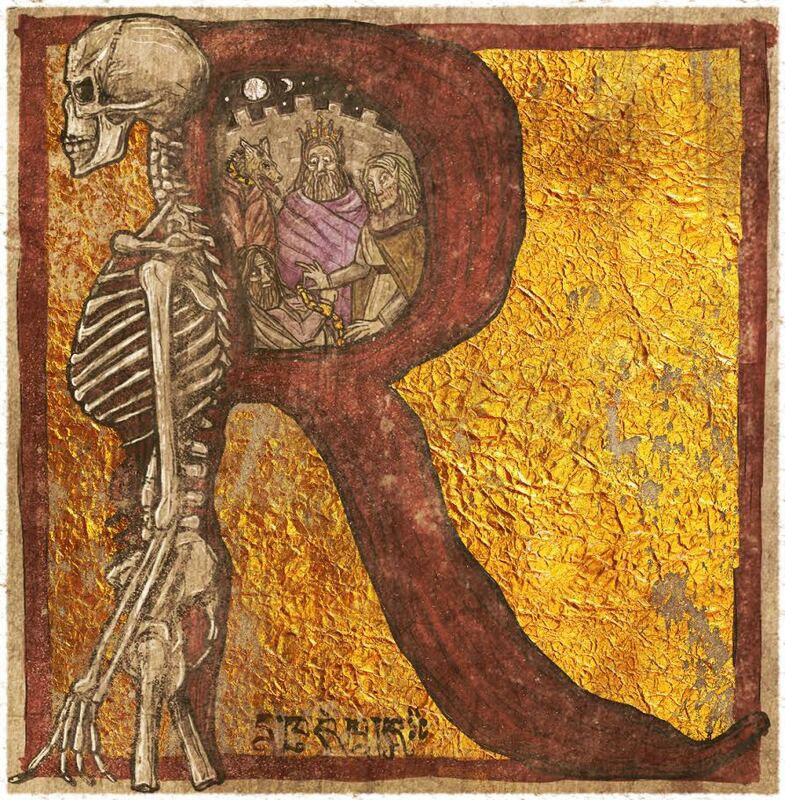 If you take a look in the hollow of the ‘R’ you will find a small illumination. There I drew a collared Ghûl (the dog-like creature), a crowned Human in purple robes, a servile brown-clad Elf, and a defeated Dwarf being chained. This is an illustration of the aforementioned enslavement of the Dwarfs, and also stands as a quick guide to the four, sentient species inhabiting the city. I then turned to the letter itself, and drew a skeleton turning its back on the life illustrated within the R (and the word Redoubt as a whole), showing how the Dead were antagonistic to the city and life as a whole. Further, I cut the skeleton off at the legs to stand as a metaphor for the city’s ability to stop the Dead in its tracks (no legs, no ability to progress), but not defeat it, for the skeleton’s back is still strong and its ‘eyes’ sharp. Further, the skeleton is incorporated directly into the capital letter to hint the city itself has the Dead within, which is a very real danger that all fear. Beneath the text, a brief note to the renaming of the city to ‘Redoubt’ is also marked with the following: ‘Named by the Accord of the Last Redoubt’. 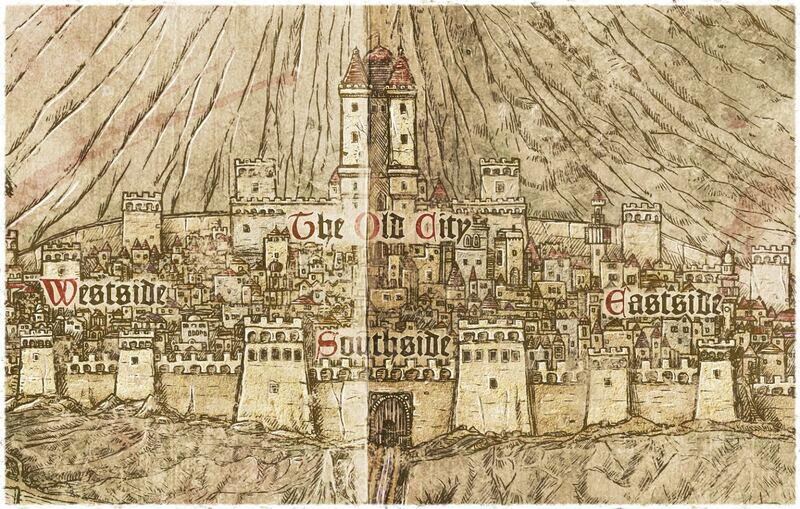 This provides a reference to another key historical event for the city, when the old Dwarf name for Redoubt – Elldimek – was abandoned by its new human rulers. 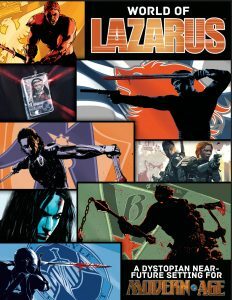 Lastly concerning the title, the continent name is also marked for the reader’s information: ‘Last Citadel of Zileska’. That all done, it was time to turn to the image as a whole and finish it off. Firstly, I drew a border to compliment the central map, and then set to work scuffing it up a little, to give the impression of use and age. I did this because I presumed the map’s original creator drafted the image a few decades in the past. This allowed the map to be worn, reflecting the recycling of all things in Redoubt, a fact of life in the over-crowded city where every resource is precious. So, I spent some time creating a tired, worn, bloodied, folded-up on itself finish for the whole image, all standing as a metaphor for the people of Redoubt themselves, who are not in the best of shape. Then I added clouds and skulls to the four corners. These represent the four winds blowing death at the city, reinforcing the idea that the Dead come from all sides, and that the curse of the Dead is everywhere, nicely subverting more typical Breath of Life imagery. I then revisited the entire map and added extra labels where required. To do this, I used three languages (at least) to show the multiculturalism of the depicted city. The first language I used was English. This stands in for the most common language in the city, a tongue of Venmir origin (the Venmir are one of the Human tribes). This is used for the title plate, all the important labels, and the very simple poetry concerning the winds I added to the four corners. 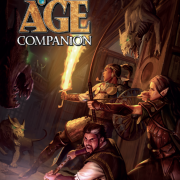 The next language on the map also uses Latin letters, and is presented as a higher/older version of Venmir (from Angati origin – another Human tribe). 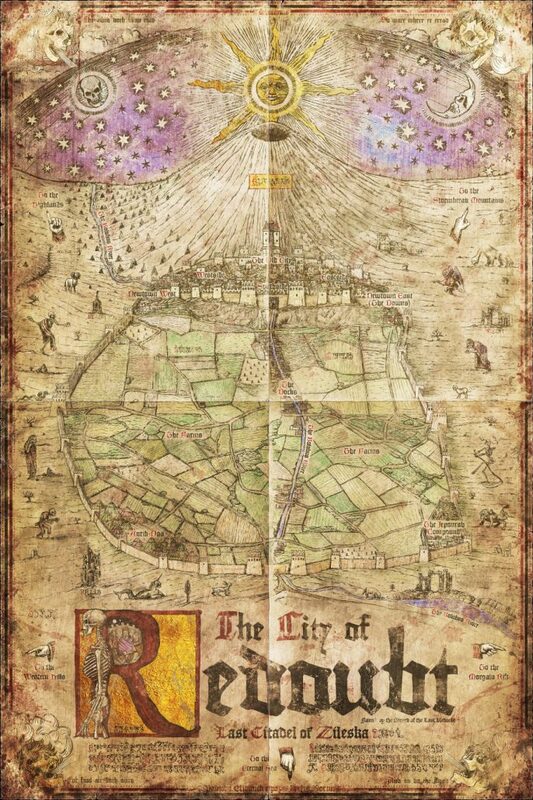 It is used to show the sunrise at the top of the map – Svitanus: ‘Sunrise’ – and to drop a reference to Elldimek, the old name for Redoubt, at the bottom of the image – Malnova Elldimek ripozas kun la Mortin: ‘Old Elldimek lies with the Dead’. Lastly, one or more languages are deployed with characters with a strong Eastern influence (Tibetan and similar), with two paragraphs at the bottom of the map beneath the title plate, and several labels elsewhere. The exact meaning of these is left to others to decide. And, then, after a tweak or two more, it was finished, and I sent the final image over to Green Ronin. So, after all that, I dearly hope you like the end result. It was a joy to create. Now I’m looking forward to later in the year, as I’m enormously excited to be drafting the detailed plan map of the inner city of Redoubt. Jaym Gates, Nicole Lindroos, and CA Suleiman sat down together at the Origins Game Fair in Columbus, Ohio, and talked about The Lost Citadel, answering some questions backers have posted to the Kickstarter project page while they were at it. Hal Mangold caught it all on video, so we can all watch and enjoy. In other news from the City of Redoubt, we have unlocked the Double-Sided Poster Map stretch goal, and are on our way to achieving System Hack: AGE, in which we hire Gary Astleford to create a system conversion document so you can adventure in The Lost Citadel using our Adventure Game Engine as featured in Fantasy AGE, Dragon Age, Titansgrave, and more! 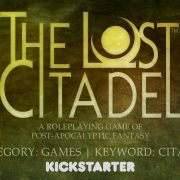 If you’d like to learn more about The Lost Citadel before (or after) backing, check out these free previews! As always, thank you so much to all our backers (and future backers)! Sometimes, as we juggle our various projects, we mention several things at once, and sometimes one link doesn’t get as much attention as it deserves. 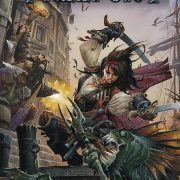 In case you missed it, you can download two really great short stories from Tales of the Lost Citadel for free, and get a glimpse into the setting of our current Kickstarter campaign, The Lost Citadel RPG. 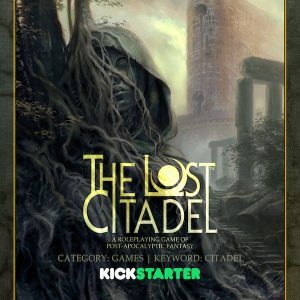 And in case you’ve missed this, too, please check out our Kickstarter campaign for The Lost Citadel RPG, and consider backing. 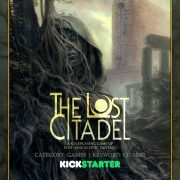 https://greenronin.com/lostcitadel/wp-content/uploads/sites/15/2017/06/facebook-banner-v1-ks4-1.jpg 615 1656 Evan Sass //greenronin.com/lostcitadel/wp-content/uploads/sites/15/2017/01/Lost_Citadel-340px-1.png Evan Sass2017-06-14 13:19:172017-06-14 13:19:21Fiction of The Lost Citadel: Two Free Stories!